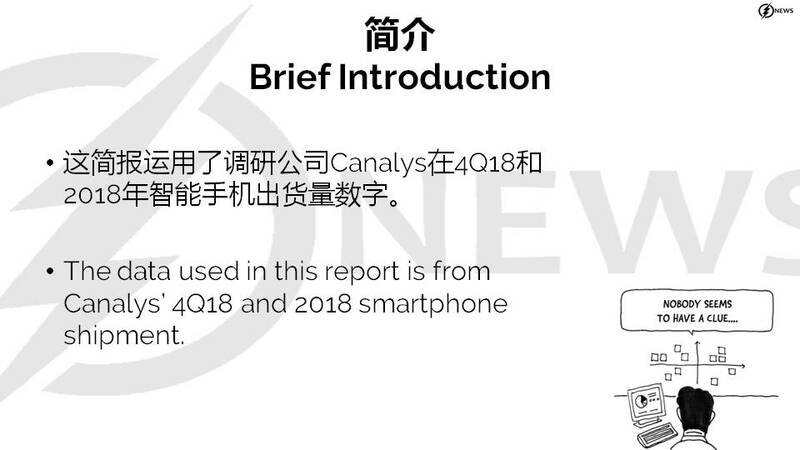 The data used in this report is from Canalys’ 4Q18 and 2018 smartphone shipment. If there are any mistakes, please kindly forgive, and will do better. In 2018, global smartphone shipment exceeds 1.38B units, but this is the first time the overall shipment has declined on year (about 4% down). Samsung still leads the market with about 21% share, but it has declined about 7.4% on year. 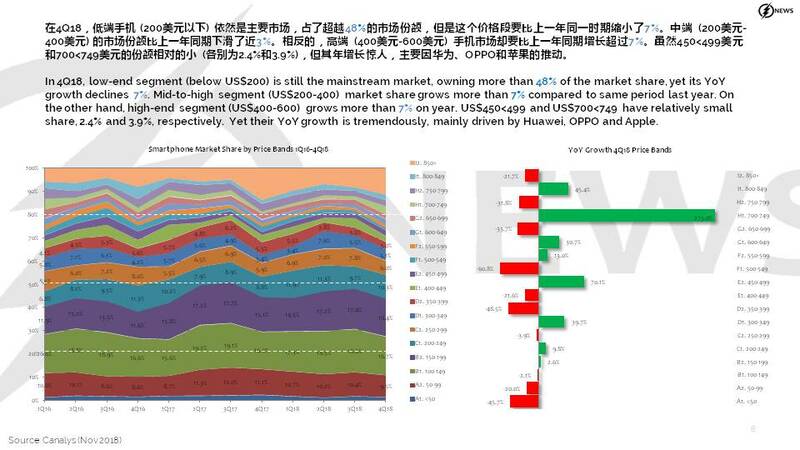 Huawei and Xiaomi perform tremendously well, increase 34% and 32%, ranking at third and forth, respectively. OPPO and vivo, on the other hand, perform marginally worse than 2017 (20% up and 29% up on year in 2017, respectively). Lenovo performs well, with about 16% increase on year. 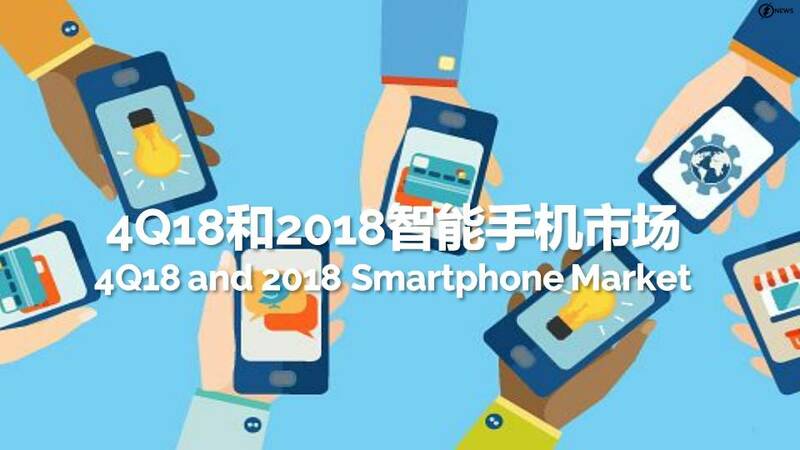 In 4Q18, global smartphone shipment exceeds 364M units, a mere 4.4% increase on quarter, but a near 6% decline on year. Apple replaces Samsung (leader in 3Q18) with marginal 0.5% difference of share, leading the market. Huawei grows about 47% on year places at number 3 with about 17% market share. OPPO, Xiaomi, vivo and Lenovo are ranked at number four, five, six and seven, respectively. 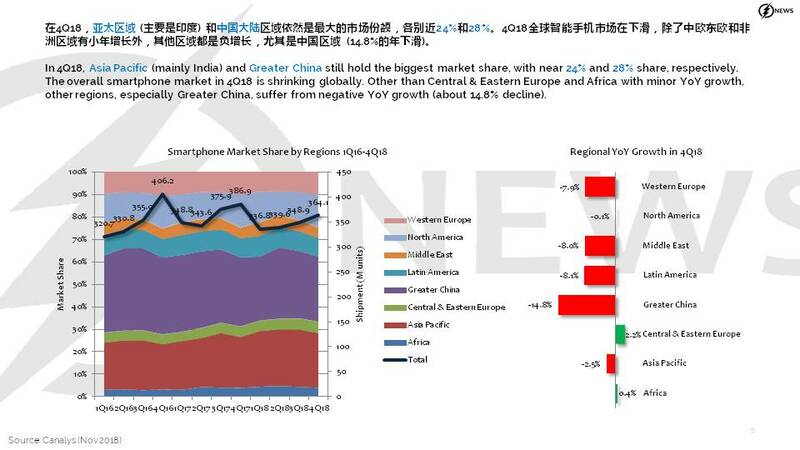 In 4Q18, Asia Pacific (mainly India) and Greater China still hold the biggest market share, with near 24% and 28% share, respectively. 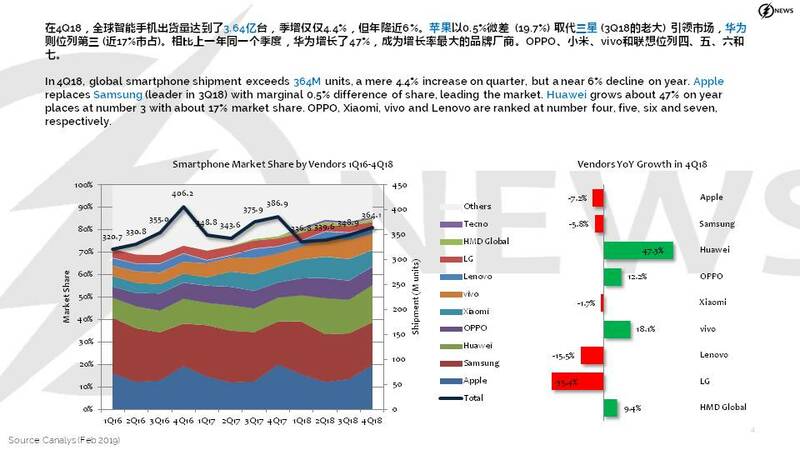 The overall smartphone market in 4Q18 is shrinking globally. Other than Central & Eastern Europe and Africa with minor YoY growth, other regions, especially Greater China, suffer from negative YoY growth (about 14.8% decline). In 4Q18, Samsung is the leader in APAC, ME and LATAM regions, yet actually its YoY growth is declining. 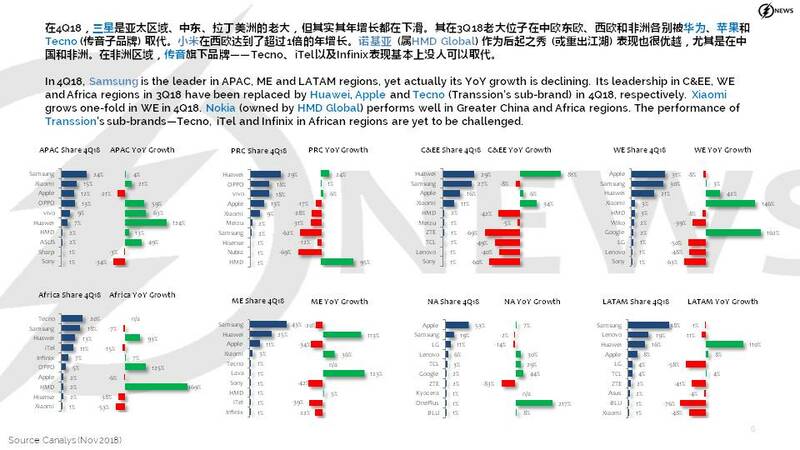 Its leadership in C&EE, WE and Africa regions in 3Q18 have been replaced by Huawei, Apple and Tecno (Transsion’s sub-brand) in 4Q18, respectively. Xiaomi grows one-fold in WE in 4Q18. Nokia (owned by HMD Global) performs well in Greater China and Africa regions. The performance of Transsion’s sub-brands—Tecno, iTel and Infinix in African regions are yet to be challenged. Huawei, Xiaomi, OPPO and vivo focus on the same market—Greater China. 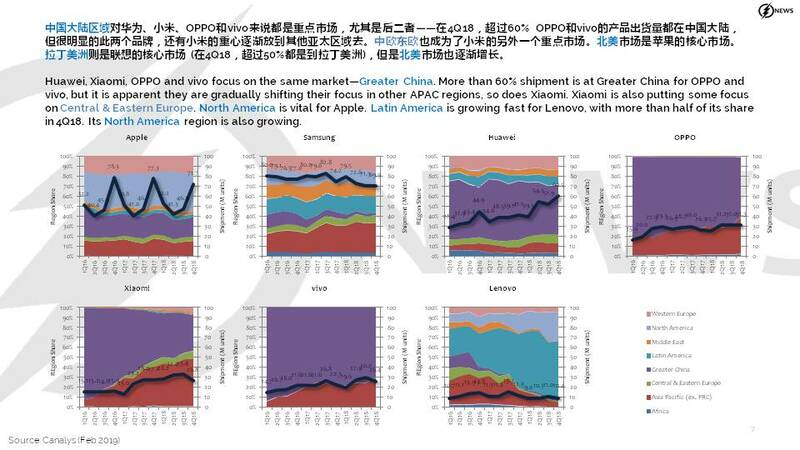 More than 60% shipment is at Greater China for OPPO and vivo, but it is apparent they are gradually shifting their focus in other APAC regions, so does Xiaomi. Xiaomi is also putting some focus on Central & Eastern Europe. North America is vital for Apple. Latin America is growing fast for Lenovo, with more than half of its share in 4Q18. Its North America region is also growing. In 4Q18, low-end segment (below US$200) is still the mainstream market, owning more than 48% of the market share, yet its YoY growth declines 7%. 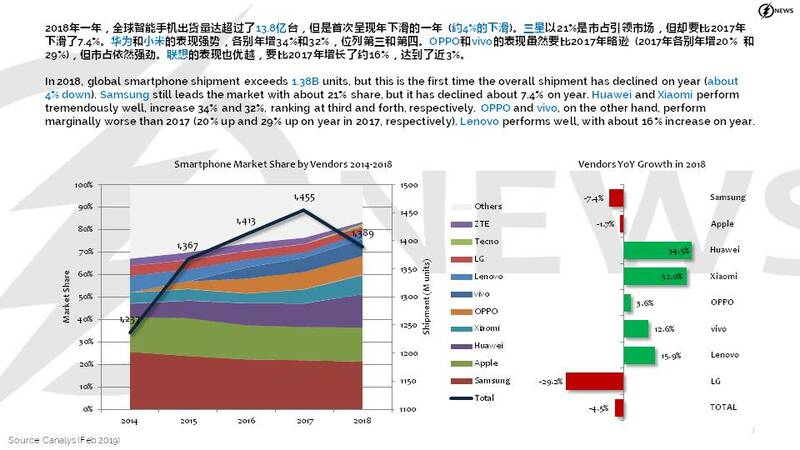 Mid-to-high segment (US$200-400) market share grows more than 7% compared to same period last year. 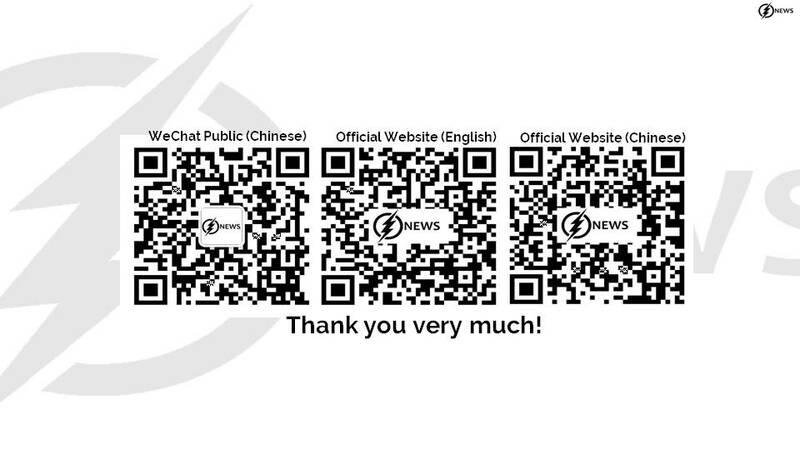 On the other hand, high-end segment (US$400-600) grows more than 7% on year. US$450<499 and US$700<749 have relatively small share, 2.4% and 3.9%, respectively. Yet their YoY growth is tremendously, mainly driven by Huawei, OPPO and Apple. In 4Q18, Apple is driving its share of US$850 above price segment to more than 40% with its new iPhone. 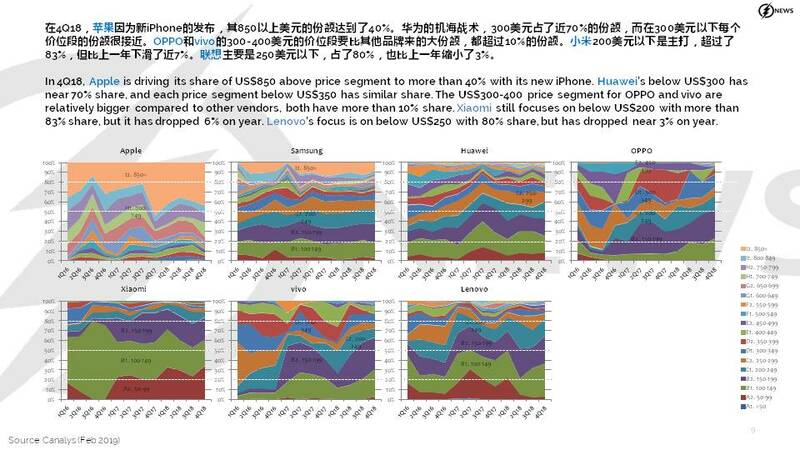 Huawei’s below US$300 has near 70% share, and each price segment below US$350 has similar share. The US$300-400 price segment for OPPO and vivo are relatively bigger compared to other vendors, both have more than 10% share. Xiaomi still focuses on below US$200 with more than 83% share, but it has dropped 6% on year. Lenovo’s focus is on below US$250 with 80% share, but has dropped near 3% on year.